Yea! The Spring Bunny came to town again! How can I tell? All the flowers are in bloom…there are big, colorful eggs hidden everywhere with special surprises inside…and oodles of chocolate! Because this event falls in the spring season, I choose to stay within color schemes that bring out a lot of greens and blues, and also a splash of pink and yellow colors (for flowers). Everything needs to have a “light and airy” feel to it – darker colors and/or all pink/red outfits could fall more into autumn or summer outfits. 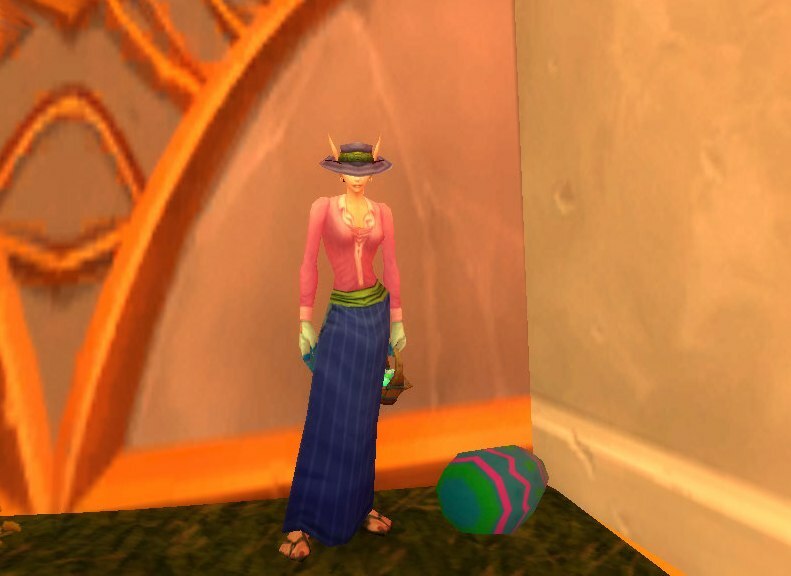 Before this event changes in 2009, the “formal attire” for this holiday were only obtainable through looting the Brightly Colored Eggs…which were scattered around only in Mulgore and Elwynn Forest (and not in the towns…). So, that really made it difficult to come in possession of one, or all, of these pieces. 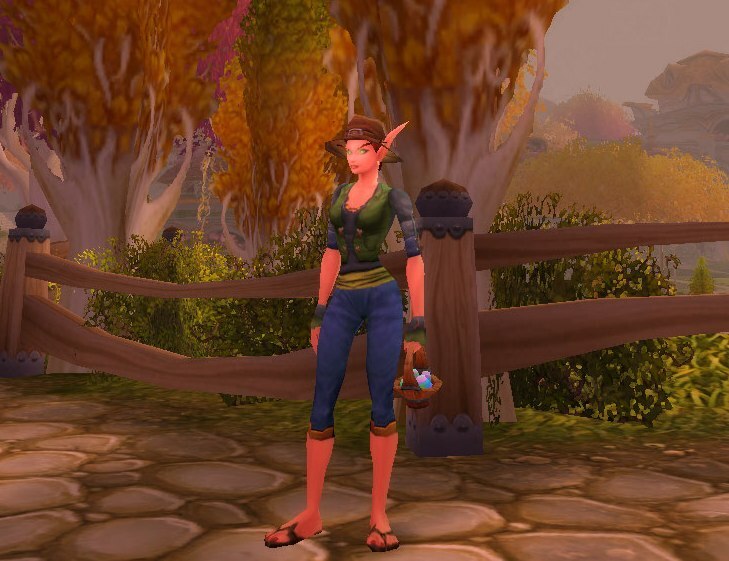 Luckily now, we can buy them, and much more, from a Noblegarden Vendor/Merchant with Noblegarden Chocolates, should looting be a problem. The other pieces I felt completed the outfit. The Dress Shoes can be switched for any other black boot; the belt can be replaced, as well. 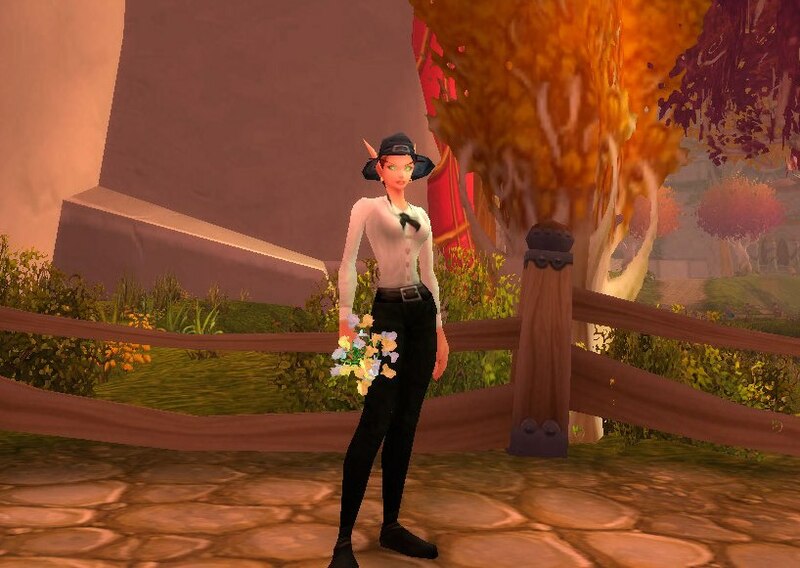 However, I love how the buckle on the Ruffian Belt matches the buckle in the Comfortable Leather Hat – which looks exactly like the Pilgrim’s Hat (for those with that helm and not the previous one). 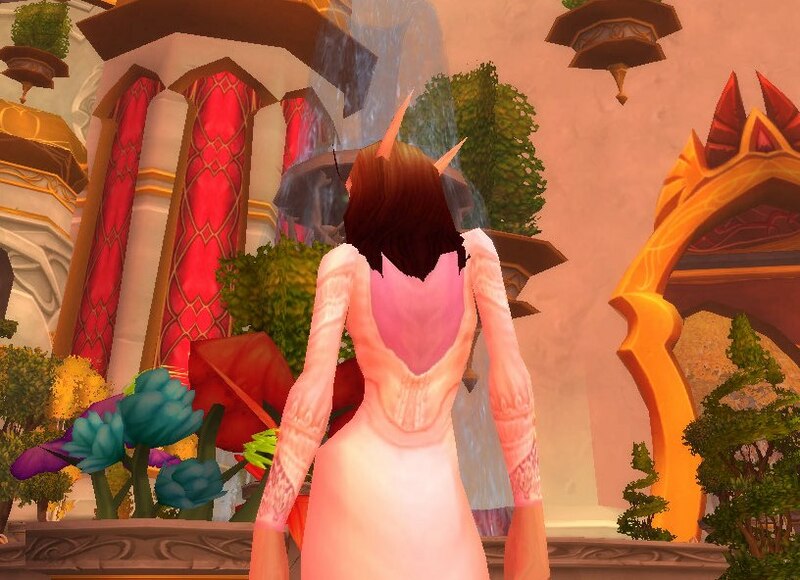 The back view of the Elegant Dress with the Pink Mageweave Shirt. Any brightly colored shirt can be worn underneath this dress and add a splash of color from the back, and, if the shirt is long enough, through the lacy sleeves of the dress. 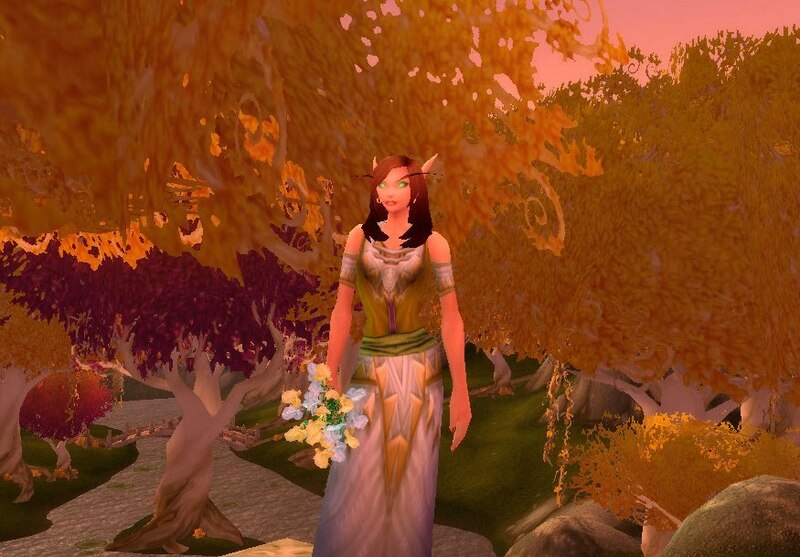 While it is not necessarily “formal” attire, this lovely white/gold “tribal dress”, I feel, captures the spirit of the rebirth and replenishment of the spring, and Easter, season – the robe’s use effect even allows your character to “plant flowers” (which is also needed for the achievement: Desert Rose). The Spring Robes with the Bold Yellow Shirt and the Councillor’s Sash (optional). 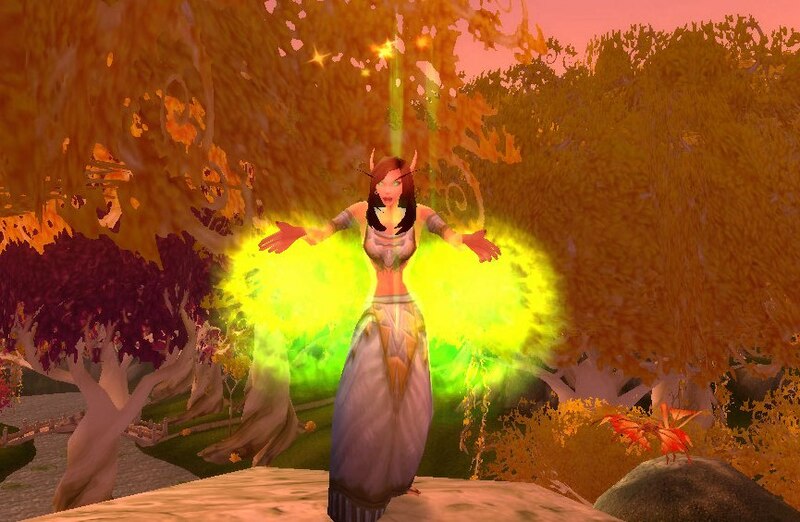 I was surprised with the Bold Yellow Shirt look with these robes; I actually find they go together quite pleasingly. The shirt being sleeveless also allows for one to be cooler in warmer weather. 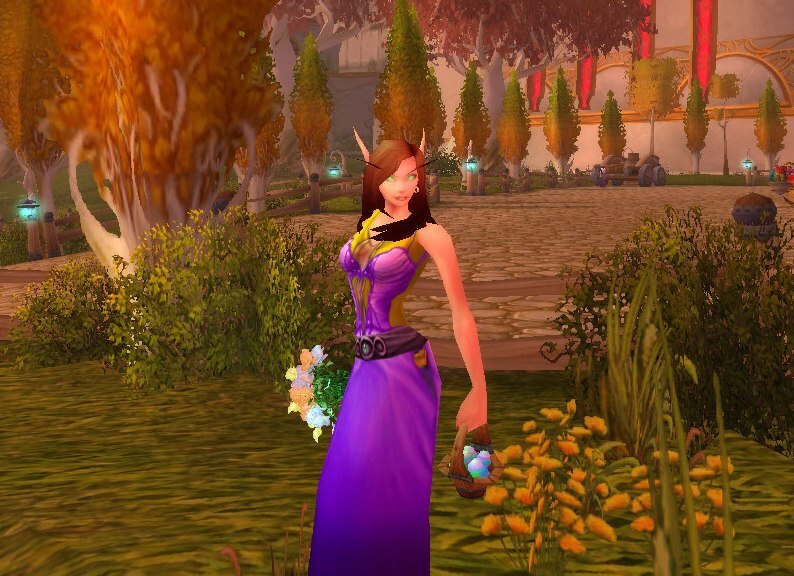 And, while I feel the Lovely Blue Dress and the Lovely Purple Dress go better with the spirit of spring and Noblegarden, I am sure there are other “springy” outfits to be had with the red and the black dress, as well. 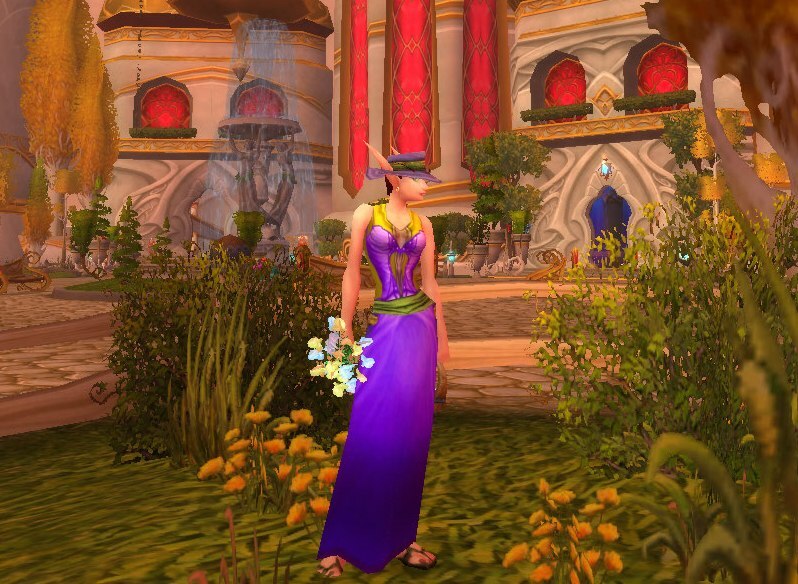 Kirina’s same Lovely Purple Dress outfit with the substitution for the Councillor’s Sash (for more color), and the addition of the Embroidered Hat (which ties the belt in nicely). 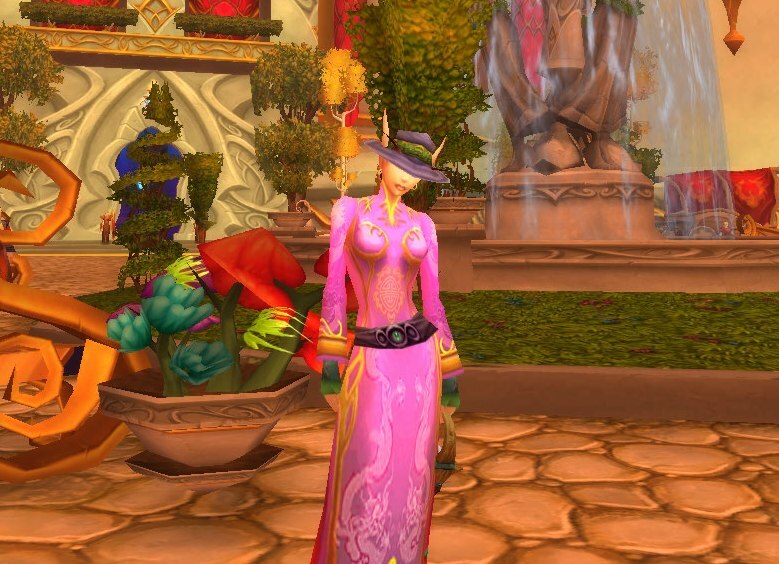 And, while we are delving back into other holiday get-ups, another formal-ish outfit to have is from the Lunar Festival’s Festive Dresses. 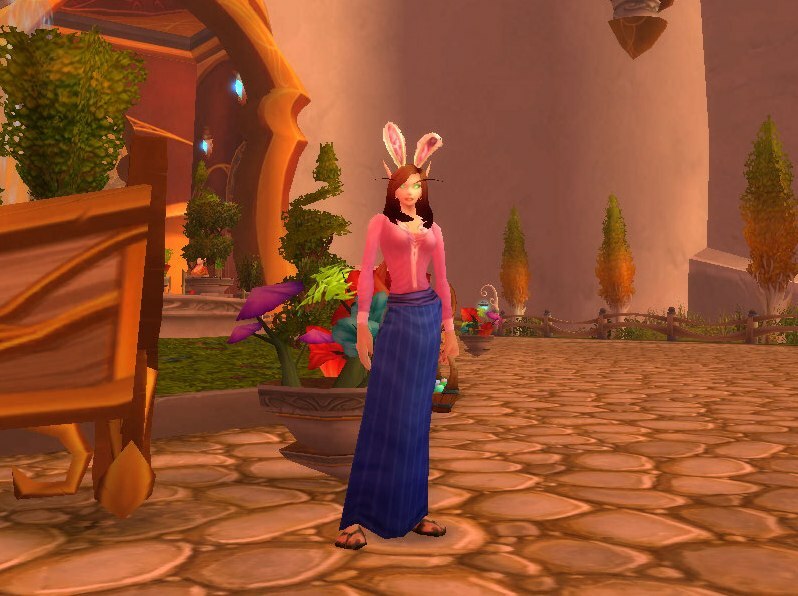 I see this outfit all the time…mainly on Tauren dudes, LoL…The bright pink of the dress is perfect for spring and Easter/Noblegarden. 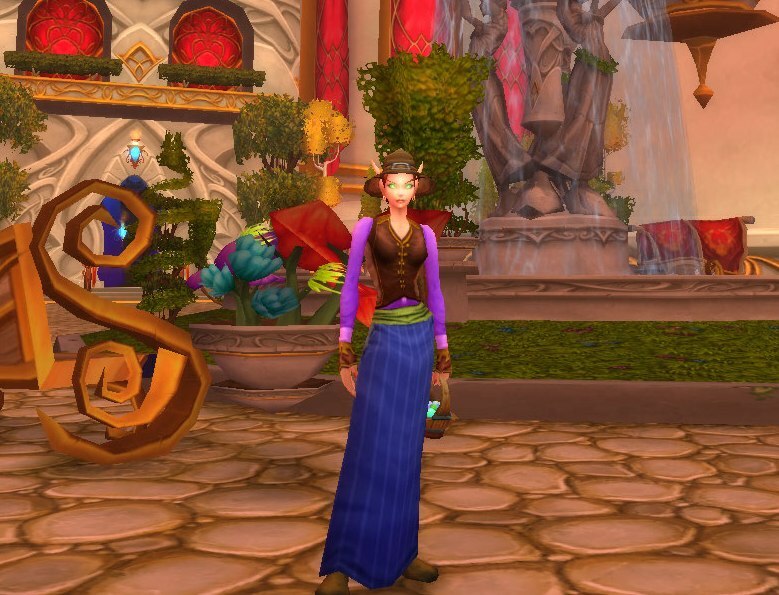 The Wizard’s Belt may be a bit much, and, the Councillor’s Sash may have been a better route for this outfit. But, the Heavy Weave Gloves’ colors do match the band in the hat, and the hat provides a darker color to the outfit without losing style or the spring color scheme. Again, the Festive Pant Suits – mainly the Teal and the Blue ones – and the Festive Green Dress, are great alternatives to run around in. 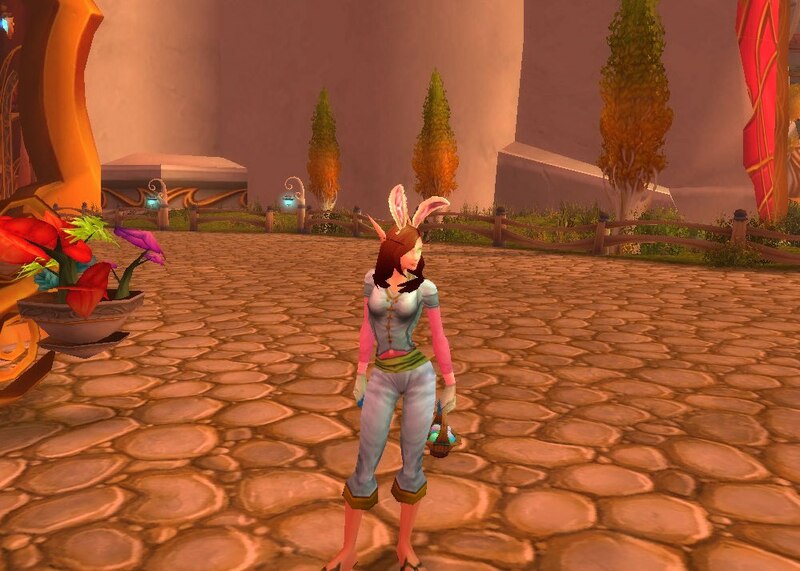 This outfit is sort of a tribute to the “snow bunny” outfit I put together in the Winter Outfits article. 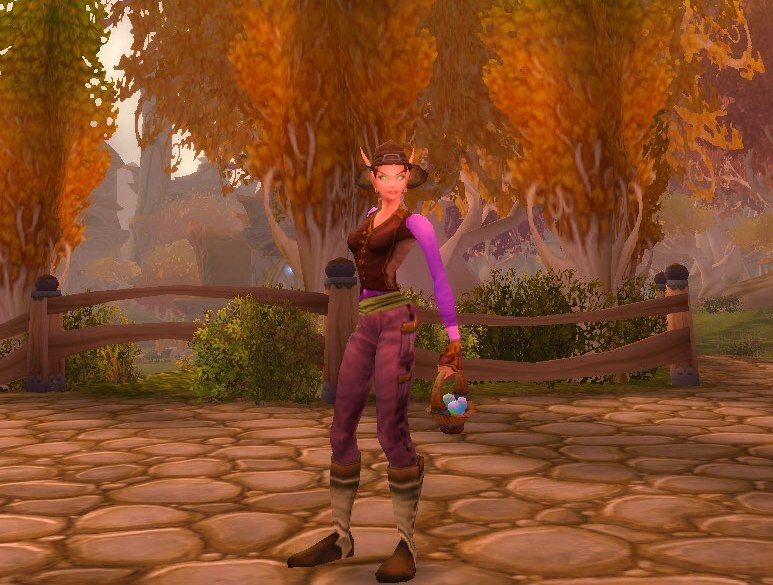 The same outfit without the Pink Mageweave Shirt worn underneath. Any colorful belt could replace the Councillor’s Sash, as could any colorful glove replace the Sage’s Gloves. However, I choose these particular because they are predominately white, and form fitted to the hand, but also gives a splash of color with its light blue fingertips. This outfit is common, yet still an eye catcher. 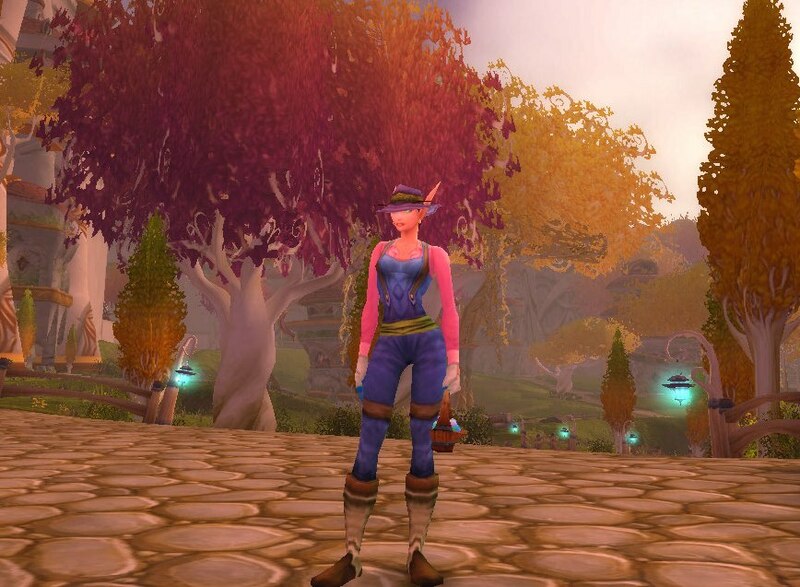 The Pink Mageweave Shirt can be replaced by any other desired, bright shirt. 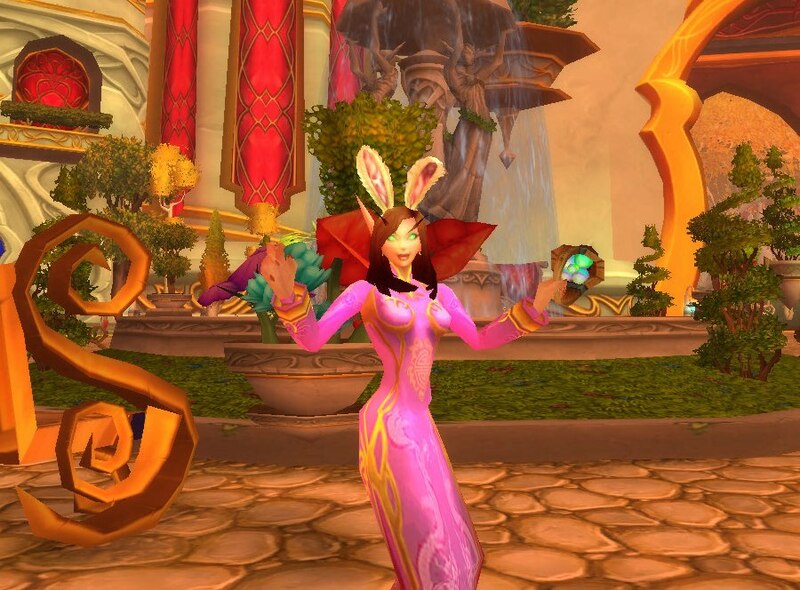 However, to keep up with the “Easter egg” look of different colors in the outfit, make sure your accessories match scheme, but preferably in different colors. In these next few outfits, I kept the top part of the outfit relatively the same, I just switched out the pants. These outfits were made to focus more on colorful trousers, but, I do not feel any “wow” factor is there for them, and thus will probably be forgotten…oh well…I’ll go through them quickly because these outfits can be made with so many other pieces of armor, it would be exhausting for both you and me to read/list the possibilities. Wearing the Starfire Vest, or even a top like the Embroidered Armor, would go great with these pants, as well. 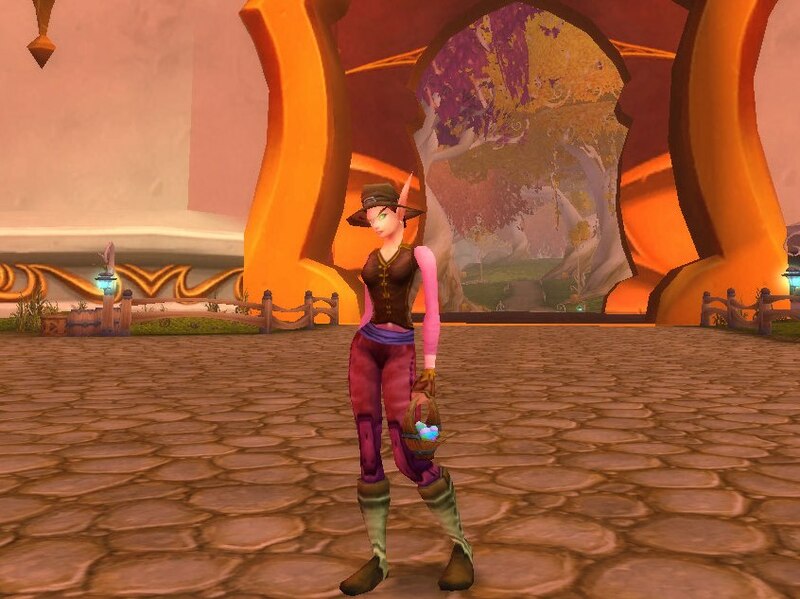 The same sort of outfit as before, only with the substitutions: Pink Mageweave Shirt, High Councillor’s Sash, and the Bard’s Trousers. 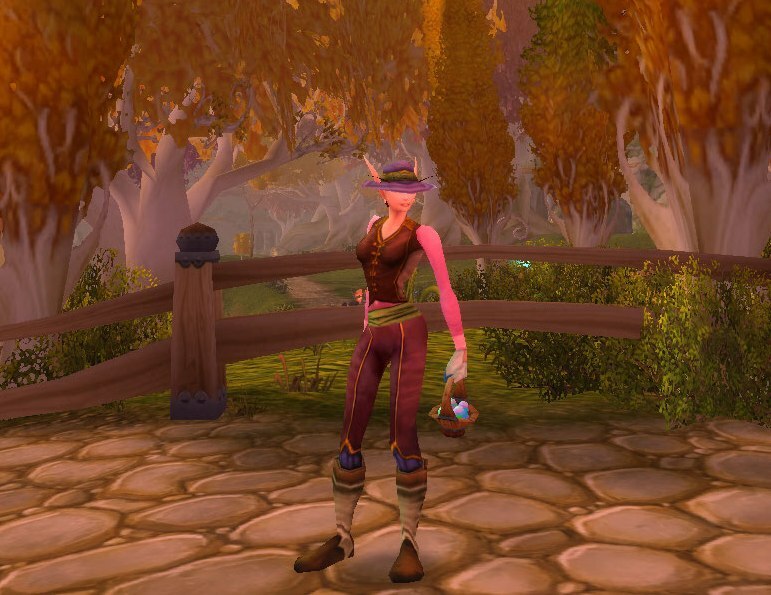 The Bard’s Trousers are a nice pink/magenta leather pair of pants that also have the “rugged” factor going for them. If pink is not your color, the Warped Leather Pants are in the same style, but in a bright blue color (also great for spring). 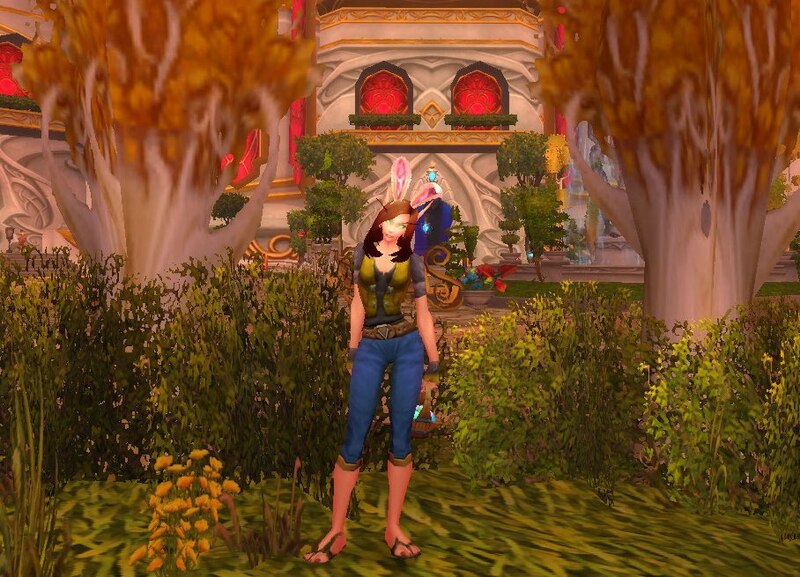 In retro-spec, I should have just used Kirina’s Embroidered Boots in this outfit…I’m getting too attached to her darling, Victorian-looking, Walking Boots. If colorful pants are not really for you, then let us go back to blue-jean style looks. The purple and yellow shades of the Cross-Stitched Vest are subdued, and perfect for those characters who still insist on wearing darker clothing while still trying to be a part of something (LoL…sounds like I described a type of “tween”. Instead of the plain ol’ Canvas Belt, this outfit could be brightened up with a lighter color belt – I would have used Kirina’s High Councillor’s Sash to play off of the darker plum color of the vest. A variation of the same type of outfit as before; here you can see how a “sashier” belt looks like with the rest of the ensemble. Both of these outfits used the blue jean capri-like Royal Trousers. 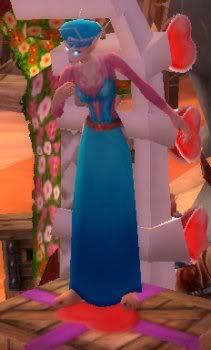 This same style can be found in other cloth pants like the Abjurer’s Pants. Longer jean alternatives could be the Calico Pants or the Knitted Pants. 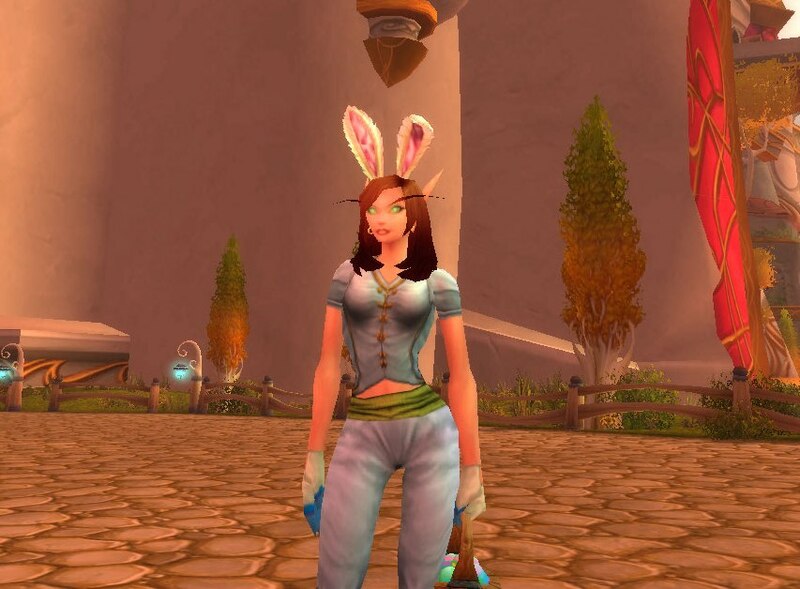 This is a cute type of outfit, for guys and gals, to wear during this event. 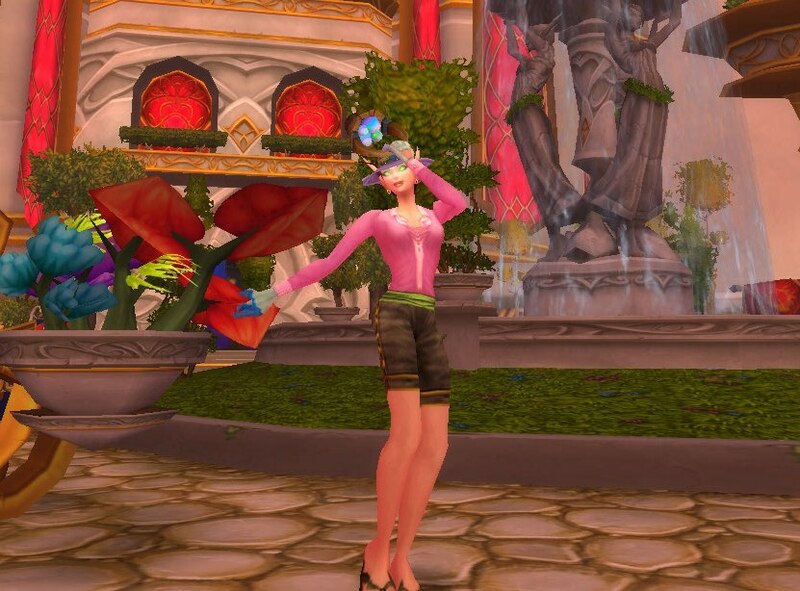 On male characters, however, the Gossamer Pants come down to almost the knees, but, I guess guy shorts in real life are made to be longer the ladies’ shorts anyway. 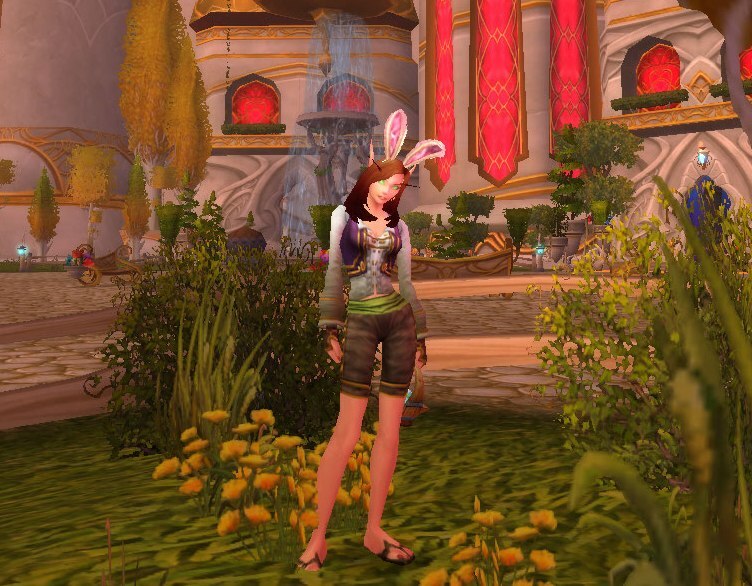 This “Easter egg” outfit is what Kirina will probably be running around in the most during this Noblegarden ^_^. Finally, some Simple Kilt outfits! 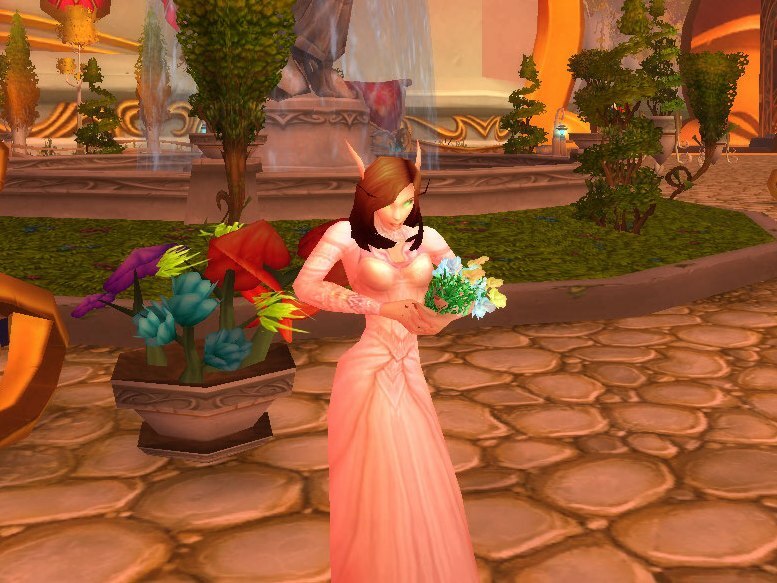 Noblegarden is also a time to join in with friends and relatives to celebrate the renewal and rebirth of the Earth. Have a quiet get together and share a meal of ham, or even some lamb (traditional Easter foods), with some good friends.